How it works: Every contestant enters with a character of their own creation. Each round, you are paired against another contestant, and you must write a brand new tale involving both your character and your opponent's. The two characters can fight against each other, fight side-by-side, go on an adventure together, hang out at a bar, or whatever else you want them to do. Whoever gets the most upvotes on their tale moves on to the next round. Your next tale must pick up where your last round's entry left off. Please include a link to your opponent’s entry at the bottom of your own entry. It’s good form. If you default1, you will be barred from entering the next OCT2. You’ll be welcome to try again in OCT 3. If your entry is deleted, you may post another. This process may continue until the voting period ends. In the event that both authors in a matchup default or neither author can post a successful entry, both authors will be disqualified. The author who would have faced the winner from this matchup will be instead assigned to a three-way match with two other competitors. Keep things relatively simple in the beginning. Since every round’s entries continue your story from the previous round, entries tend to get longer and more complicated as the competition progresses. You’ve been given a lot of freedom in this OCT—be sure to use it! Don’t feel limited to traditional structures and settings. Time management is key! Don't forget to budget time to read your opponent's material. You may use existing characters (including SCPs!) as long as you created them. New characters are fine, too. All your entries3 must tell one continuous story. Your Round 2 entry should pick up after the events of your Round 1, and so on. However, your entries are not required to follow the continuity of other contestants' entries. Your character can be human, animal, vegetable, mineral, or anything else you can imagine. Just make sure the character is interesting. The opponent's character should be featured heavily in your entry. You can't just write a tale that's 99% about your character alone. There will be 16 contenders, which means four competition rounds. In the event of a large response, this will be expanded to 32 contenders and 5 rounds. You may assign a back-up character to use in the event your preferred choice doesn't get in. 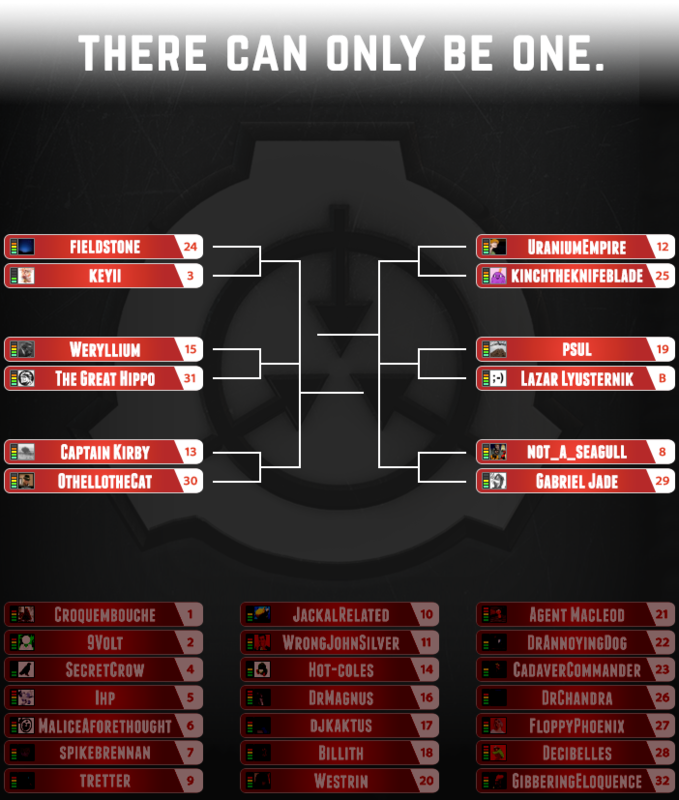 The following contestants did not clear the list to make the main bracket, but because we had way more entrants than expected, there’s enough for a side-tournament! Contestants will compete in 2 rounds in groups of 3. The winner will join the main tournament in Round 3. Everything essentially works the same, but you’ll need to fit two opponents’ characters into your entry. Good luck! The Plague Doctor Leslie "Don Quixote"
Posting ‘deadline’: October 20, 11:59 pm CST. End of voting period: October 27, 11:59 pm CST. but your entry will consequently have less time to receive votes. 2. Assuming there is one.